The River Arle is only 5 miles long and is a major tributary of the River Itchen, famous for its clear chalk-spring fed waters and rich biodiversity. Chalk rivers are rare environments with a unique assemblage of flora and fauna, including many protected species. In recognition of this, the Itchen and its tributaries, including the River Arle, have been designated as a Site of Special Scientific Interest and a Special Area of Conservation. Our stretch of river is neither formally stocked nor fed, and we endeavour to maintain the river and its banks in as natural state as possible, whilst still keeping the beats accessible. Working with nature, we are slowly improving the health of the river so that it can reach its full ecological potential with maximum species and habitat diversity. Put simply, we wish to re-create ‘the finest chalk stream’, with the best wild trout fishing in the country - a status this stretch of river enjoyed 150 years ago. During the last few years we have undertaken extensive restoration works to the lakes immediately adjacent to the river. We are now returning more water to the river at a higher point than previously which has significantly improved the river fishing. We will also shortly be able to offer fishing on the lakes as well as the river for those who are interested. We hope you will be part of our success by understanding the implications of this undertaking - please tread lightly and be respectful of our beautiful flora and fauna while enjoying the river. We are very committed to enhancing this beautiful environment and also to sharing it with people who will respect it and enjoy it. 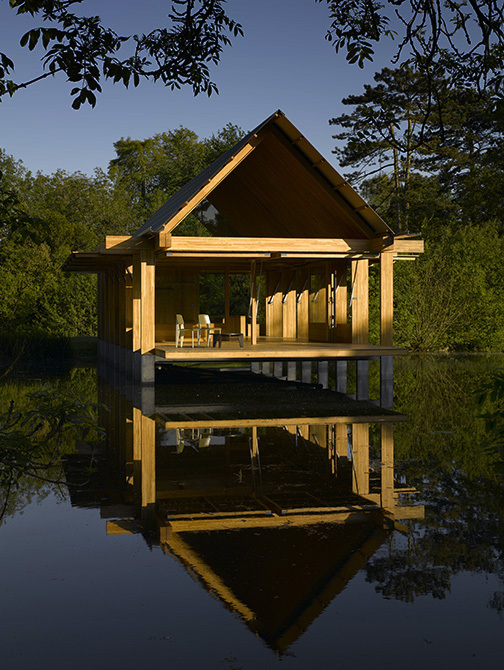 We have a beautiful fishing hut available to members of the fishing syndicate. It is situated on the larger lake adjacent to the river. It provides members with a toilet, somewhere dry to store kit and get changed, and a small kitchenette to make tea or heat food. Please remove your shoes or boots when entering. Members who wish to use the fishing hut more extensively, or to bring guests, are requested to contact Peter Korniczky, the Syndicate Manager, to make arrangements. Please respect the fishing hut and leave it in the state you would wish to find it. Please note it is there to support your fishing activities and not a place to work or entertain. We have 2 river beats for the syndicate. The "Eel House Beat" and the "Keepers Beat". Please note that a short stretch of river between these beats is owned by our neighbours and is not available for fishing. • Anyone fishing must hold a valid Environment Agency rod Licence. • Trout fishing starts mid April and ends mid September. • Grayling fishing starts at the end of the trout season and runs until the first week of December. • Fishing can take place on every day of the week except on Mondays. • We do not plan on closing the fishery on the published weed cut days so please be aware during weed cutting fishing may occasionally be mildly interrupted either by us, or by upstream riparian owners. • Fishing is limited to the period from dawn until dusk. • You are permitted to bring one guest per fishing day on the condition that you fish together. On no account should a guest be allowed to fish on his own. The host must be present at all times and remains fully responsible for all actions of his guest. • Fishing is by fly only. Hooks must be barbless to a maximum size of 12. • Fishing is strictly catch and release. All fish caught, irrespective of species, must be released. • Parking – irrespective of fishing which beat - is permitted only in the designated area indicated on the map. • Please make sure that all gates remain closed and that they are locked at all times. • Keeper’s beat runs from the bridge at Drove Lane up stream to 3rd wooden bridge by the small wooden water mill. Please do not use this bridge as it is located outside the site boundary. • Upper Eel House beat runs from the gate on the left hand bank just above the Eel house to the end of the path where the river bends left and forms a large pool. • To reach the Upper Eel House beat, please cross the field where indicated on the map, through the small gate to the left of and above the stable block, and follow the footpath toward the Eel House. • Upper Eel House Beat: in view of the footpath along the lower section, do not fish from the right hand bank. • All members are asked to complete the records book after each day’s fishing. This can be found in the angling hut by the river near the car park. • Please do not bring dogs to your fishing days. • We retain the right of access to the river to carry out maintenance when required. • We cannot and do not accept any responsibility or liability for any accident or personal injury to members of the fishing syndicate or their guests; neither can we accept responsibility for any damage to, or theft from parked vehicles. • Please report any damages (caused or observed) or any sightings of unauthorised visitors to the River Habitat Manager as soon as possible. • In the event of conflicts or disputes between syndicate members the Syndicate Manager is the arbiter. • Please note that White Clawed Crayfish are present at this site. This species is in serious decline due to a plague introduced and carried by the American Signal Crayfish. White Clawed Crayfish are protected under the Wildlife and Countryside Act 1981 and it is an offence to recklessly or intentionally kill or injure them. • All fisherman and visitors to the River Arle should ensure that they are not transporting and introducing crayfish plaque from contaminated sites. Footwear, nets and fishing tackle should be clean and dry and whenever necessary disinfected. You will be provided with a supply of appropriate disinfectant at the start of the fishing season. For further information, please refer to our bio-security guidance document.